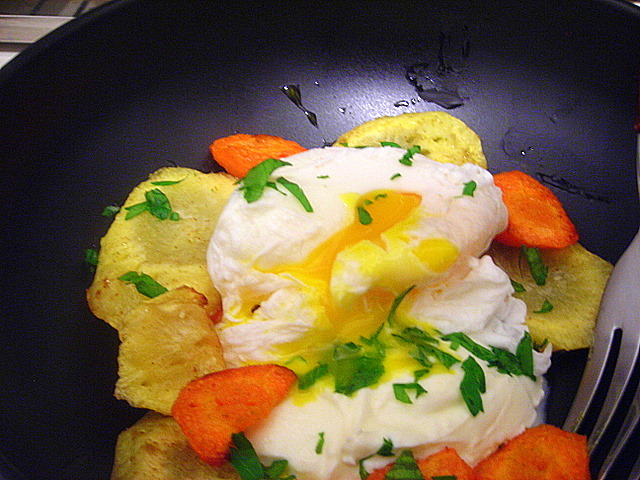 This is a variation on something I started making last year — roasted vegetables, cheese and a poached egg. This doesn’t need much in terms of additional seasoning. Maybe the tiniest bit of chopped parsley or a drizzle of extra-virgin olive oil. Your basic roasted vegetable recipe assumes 2 tablespoons olive oil; salt and pepper to taste. Here, I substituted ground cumin for the pepper. Roast for 15 to 30 minutes at 350 F depending on the amount and type of vegetables used. 09 Apr	This entry was published on April 9, 2009 at 12:01 am and is filed under food, general, vegetarian. Bookmark the permalink. Follow any comments here with the RSS feed for this post.